The Muzoracle is subtitled “The Tarot of Music,” and is sometimes described as “a musical cross between Tarot and the I Ching.” How exactly is the Muzoracle related to those two systems? What are the differences between it and them? The Tarot deck is divided into two types of cards, the Major and Minor Arcana. The Major Arcana is made up of the 22 archetypal, pictorial cards most commonly associated with Tarot: cards like The Fool, The Empress, Death, The Sun, and so on. The Minor Arcana is made up of 56 cards divided into four suits, and includes numbered cards and court cards; those are the cards from which our standard playing cards are derived. 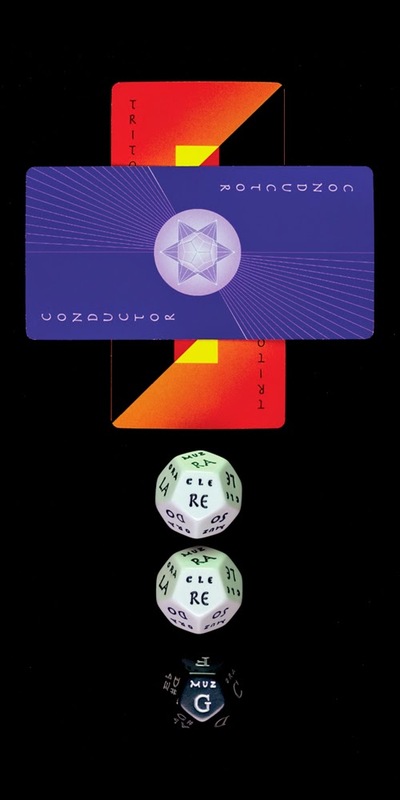 The Muzoracle deck is analogous to the Tarot deck in that its cards, too, are divided into two types: the 34 Compositionals and the 55 Harmony Cards. Honestly, though, the similarity between the two decks pretty much ends there. The Compositionals are based on musical concepts and directives found in musical composition: things like Melody, Tonality, Rhythm; slow down, get louder, repeat, pause. The Harmony Cards, divided into five suits, are the more archetype-driven cards in the Muzoracle Deck; but they are based on sonic archetypes, two and three note combinations that convey their meaning primarily through their sound rather than their images and ideas. The Harmony Cards also include their version of the court cards; in lieu of kings, queens, knights, and pages, however, there are conductors, soloists, and accompanists. The similarities between the Muzoracle and the I Ching are even more amorphous, with one significant exception: like the hexagrams of the I Ching, the positions in a Muzoracle casting are characterized by underlying movement. Muzoracle mythopoetics are driven by something called The Harmonic Engine: all of the elements in a casting contain and are contained within other elements, which are all on the way to and from somewhere else. The workings of the Engine may not be obvious in a casting, and a theoretical knowledge of them is not necessary in order to use the oracle; nonetheless, the Engine’s action pervades the Muzoracle experience. There is a sense of things in motion that one can tap into and use, rather than some sort of fixed doom that one is sentenced to live out. Indeed, it is this “lack of fixedness” that separates the Muzoracle from other divinatory tools, especially the Tarot. Each card in the Tarot brings a lot with it: those images, those terms, those numbers, its history of use as a predictor. Therein lies its power, and its attraction, and its potential for good use and misuse. The Muzoracle is not meant to supplant the Tarot, nor to pose itself as greater-than; it is simply different. Each position in a Muzoracle casting is defined by keywords, a sound, a place in a scale, a geometric shape, a color… a combination of abstract elements that fire the imagination and intuition. The relationship between querent and reader is more one of creative co-conspiracy than prophecy; the endgame is empowerment, a sense of choices one owns.